Uncertainty is creeping back in the asset markets. In the US, the stock market volatility is staging a comeback. The yields of the long-term bonds are rising and the yield curve has flattened. On Friday, the stock markets were under heavy selling with the Dow Jones Industrial average suffering one of the worst one-day point declines in its history. Looking back, we find disturbing similarities with the period just before the biggest single-day stock market crash in history: the Black Monday in 1987. Before crashing in 19 October 1987, the stock markets were beating records. The bull market started in August 1982 and raged through the ‘Roaring Eighties’. 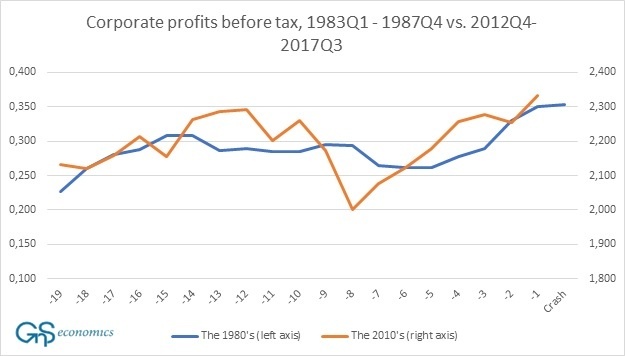 The upward momentum was driven by fast economic growth, by the extensive growth of corporate profits, by the influx of new institutional investors which increased the demand for stocks and by tax breaks for mergers and buyouts. Although the interest rates were somewhat high (the federal fund rate was 7.5 %), they had much decreased since summer 1981 (around 19 %). Compared with the 1970s, inflation was actually low. It was the Goldilocks period of that time. Complacency took hold. In early summer 1987 something changed. The interest rates started to rise. Doubts about the virility of the economic expansion started to linger during the fall. The growing trade deficit of the US and the declining value of the dollar raised concerns about inflation and the need for higher interest rates. Uncertainty was increasing. On the 14th of October, the stock markets started to fall. It was first fueled by the rumors of the elimination of tax benefits associated with the financing mergers and the announcement that trade deficit was well above the expectations in August. The dollar declined further. On Thursday, the decline in the stock market continued. The institutional investors were getting anxious and started to transfer funds from stocks to bonds. On Friday, the decline in the stock markets started to gain speed. During the previous two days, the price movements had eliminated many of the at-the-money options, which lead to difficulties for investors to hedge their positions. They looked for shelter by selling future contracts. The heavy selling of the futures contracts created a price discrepancy between the value of the stock index in the futures market and the New York Stock Exchange (NYSE). At the close, S&P 500 was down nine percent for the week, which was one of the largest declines during the past decades. On Monday, the 19th of October, a substantial selling pressure build up for the NYSE at the open. This delayed the opening of trading for the first hour, which made the NYSE index stale. By contrast, the market for futures opened on time to heavy selling. A large gap between the values of the stock indexes in the cash versus the futures markets evolved. When the stocks opened, prices fell promptly. The index arbitragers observed that they had sold stocks below their expectations and tried to cover their positions by buying in the futures market. This induced a temporary rebound of the prices increasing the confusion among the traders. The portfolio insurer models prompted them to resume sales. They sold both in the cash and futures markets. The cascade of sales overwhelmed the short rally and the markets crashed. At the close, S&P 500 had lost (around) 20 % of its value. Before the opening of the markets at the 20th, the Federal Reserve issued a statement that it will “serve as a source of liquidity to support the economic and financial systems”. Around seven percent of stocks were closed for trading. The margin payments were cleared before opening. The corporations started to announce stock buyback programs already on Monday, but the critical mass to make an effect on the stock markets was formed only on Tuesday. A small rally evolved at the end of Tuesday trading and carried on for Wednesday. The stock markets have been pushing higher for several years and interest rates have been very low for an extensive period of time but are now trending upwards. The dollar has fallen, the US trade balance is negative, economic growth has been sound but doubts about it are starting to linger and the inflation expectations are rising. Corporate profits have also recovered strongly from a previous slump. All these developments preceded the 1987 crash. In addition, this rally has also seen an increase in the program trading, but in much bigger numbers than before the crash in 1987. One big difference is the valuation level, which was more moderate in the 1980s. And, although it cannot be used as an indicative sign, last week’s stock market performance bears some eerie similarities with the week that preceded the Black Monday. What becomes to the options of the Fed to respond to a similar crash, the things are rather different now. In 1987, the Fed quickly dropped its fund rate to 7 percent from 7.5 and injected reserves to markets. Now, a 50 -basis point cut in the federal fund rate would take the rate back to the range 0.5 – 0.75, which would likely have a very limited effect of the short-term rates. The Fed has also been pumping massive amounts of liquidity in the markets through its QE program. While re-starting the program would surely provide some temporary relief, there is no certainty that it would be enough to stem the panic; moreover so, because the program trading has a much bigger role now than in 1987. In the 1980s, the main innovation in the program trading was the portfolio insurance, where the computer models were used to optimize the stock-to-cash ratios at various market prices. Most of the portfolio insurers used the futures market, which was likely to increase the downward pressure of the stock prices during the fall. Currently, the automatic trading is much more widespread. It is estimated that around a half of all trading in the US stock markets is executed by algorithms. Also, it is estimated that ETFs, the risk parity funds and the volatility target funds hold some $8 trillion of the so called passive private assets. They have contributed to the uninterrupted upward trend in the equity markets, but their behavior in a large market correction is untested. When a deep enough correction is reached, the algos are likely to start to sell and short the market and the ETFs and other funds will start to lose value en masse. This will turn their passive assets very active to the sell side. When this point is reached, selling in the markets is likely to morph into a rapid crash halted only by the circuit breakers. To make things more alarming, the global economic situation resembles more the time before the Great Depression than before the crash of 1987. This makes it possible that, if a stock market crash occurs, it will start a path towards a global depression. Thus, after nearly a decade of central bank induced market manipulation, we may finally be closing to the point where the Abyss starts to gaze back at us. The timeline of the 1987 crash and details before it, were obtained from “A brief history of the 1987 stock market crash with a discussion of the Federal Reserve response” by Mark Carlson.